Nike is going off this All Star break, first with a flood of new colors for the Lunar Vapor Trout, and now with something we’ve seen pop up in the last year or so, finally revealed in full. 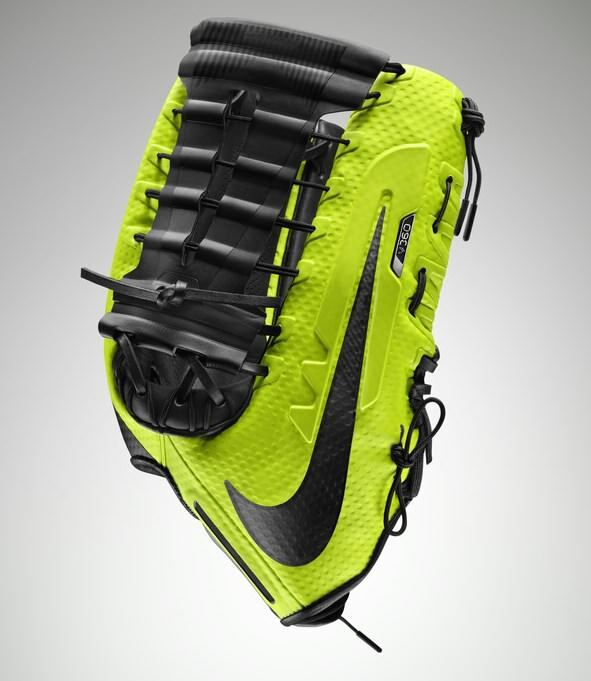 The Nike Vapor 360 outfielders glove, a synthetic glove that incorporates Nike’s shoe technologies like Hyperfuse and Flywire, will be available FOR THE HOLIDAYS. This is the glove that we saw Cargo first wearing last season (and still is) with some notable tweaks. The most obvious tweak, if you check out Cargo’s (profile) and Springer’s (which he received earlier this season), is the colors. Yes, more Volt. A lot of Volt. Detectable from space Volt. What I also noticed, though, are some performance-based alterations that we should take a look at. Notice in Springer’s photo of the outside of the glove (and even in the computer rendering in the gallery above) that the base of the web is strung up with what looks like shoe-string, an element that, when we first posted, you all didn’t like very much. In its place, Nike has reinforced the most important part of the web with actual leather lacing, as you can see in the gallery above. Just by the looks of it, I would say that the palm of Springer’s Vapor 360 prototype was completely leather-less. That palm looks man-made to me, so Nike might have gotten some feedback that directed them away from synthetics where the ball was making contact with the glove. Maybe it was too slick and the ball was tougher to secure? Maybe it broke down from the everyday beating? Either way, I think its a good move, because by perforating ACTUAL leather, they’ve managed to stick with the key inspirations behind the new technology, to make the glove lighter and easier to break in, but without sacrificing performance. How much would it hurt to catch a fast-moving ball in the palm? Is the shoelace/synthetic web too flimsy? Not necessarily to catch the ball, but to form a good strong pocket so when you want to get it out of the glove its not sitting up in the top of that V-shaped web, or worse, squirting out. Bottom line is, I’m intrigued. I think if there was a position that this would work for, its the outfield, where speed is much more important. I’m interested to hear your thoughts on it as well in the comments below. Any word if they are coming out with a first baseman model? What about a shortstop glove? When will the solid black color be available?